April was a good month for me! And it’s looking like this month will be good as well. In fact, if I receive all the payments I’m expecting May might even be better than April. I had a few of my normal expenses and of course, taxes! I think it’s helpful to see that I don’t get to actually keep all of this money. P.S. 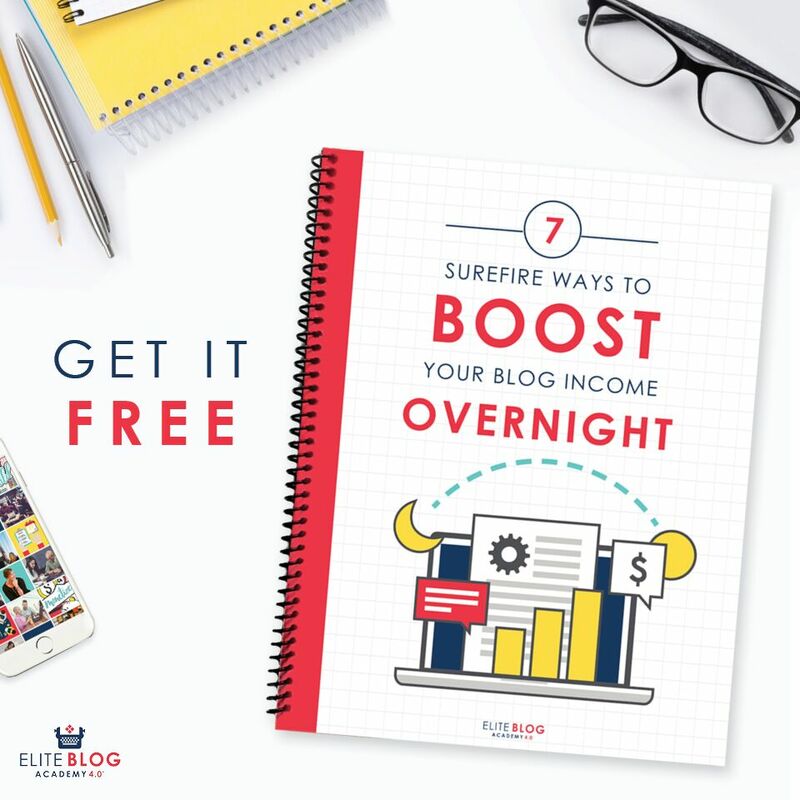 If you’re interested in starting a blog too, check out How to Start a Blog for Only $12 per Year. This post walks you through setting up your own WordPress blog through GoDaddy, my favorite hosting company. The thing about money that’s hard is that numbers never end. I set the goal to earn $60k this year and it’s starting to feel like that’s going to be a pretty easy number to hit. In fact, there are a couple of things I know that I could immediately do to earn more money, I’ve just been slacking! And earning more money is not about greed. It’s about progress. What I think I’m trying to say is that earning $4k – $5k per month doesn’t feel any better than earning $2k – $3k per month AFTER you do it a couple times. It starts to feel normal and then you want to shoot for more just because you know that you can. I’m just as happy now as I was a year ago. But it’s human nature to want to keep doing better and better. The fun is more in the journey of challenging yourself than it is in actually reaching that end goal. I think that’s why you see posts floating around the blogosphere titled “You Paid Off Your Debt – Now What?” Working toward paying off that debt challenged you in so many ways. Then you hit the destination and don’t know what to do from there. It’s very anti-climatic. And then one hand I sometimes feel guilty about earning more money. Okay, scratch that. I don’t feel guilty about earning more money I feel guilty TELLING people. I was looking up statistics in my county the other day and the median one person income is $18k per year. The median household income is $39,091. So now when a family member asks me how much money I’m making I get kind of nervous to tell them. I almost feel bad. Especially, for those who owe tens of thousands of dollars in student loans and aren’t making very much money. Or when I tell someone and they immediately get quiet. Depending on where you live $5k a month might not be a whole lot. But in my area it definitely is. 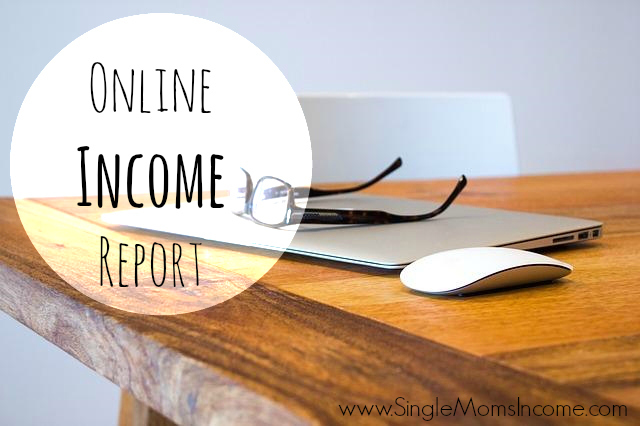 I started these income reports when my blog was teeny tiny and I was earning $1,800 per month (sometimes less) and was completely on my own, but living my life perfectly fine. 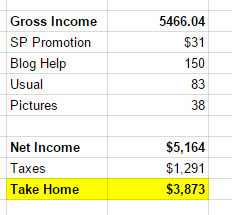 Income reports were a great way to keep me motivated and hopefully inspire other people and I just don’t want them to make anyone feel bad. Especially, if they are having a hard time making ends meet. At the same time I’ve worked hard to get here and I am not taking that for granted. Oh yeah, I’m having some internal conflict. I am being delusional? What do you think? WHAT!? I have been reading your blog for months maybe years, and I get what you are saying. You set yourself goals and you are reaching them far beyond what you expected. Why feel guilty? If people ask you and they feel bad they shouldn’t have asked you in the first place. Another way of looking at it is that to them you are role model and are curious. You were able to do what you set yourself to do and you did it. Thank you, Joyce! I don’t actually feel bad about making money. Actually the better I do the more motivated I become. I just have had a couple people personally ask me what I’m making now lately and then when I tell them they got super quiet. Then it got kind of awkward feeling. I am still going to hustle 😉 I suppose I just don’t like being “Hey look at me!” When I know there are many other people who are struggling. Hi Alexa!! I LOVE your income reports and have been refreshing your blog waiting for this one, lol! It’s definitely SO inspiring for me as a blogger and freelancer to see these. I post mine, too, and just had my highest month of $2700. The problem I personally have with posting my income reports is I feel pressure to beat myself every month, even though I’m totally content making whatever I make – whether that’s $500 or $5000. Does that make sense haha? Thanks for sharing!! Hope you have a great day! Thanks for your input. And I saw your income report too. Congrats on an awesome month!! Please keep posting your updates. I have trouble making ends meet, but when I read your posts I think WOW! Maybe I can do it too. I just don’t know where to start. You inspire me and that means your inspiring others as well. I can imagine that it must be difficult to look into the shocked faces of others, but you can not see my face when I read your posts. Keep going mamma! I would love for you to hit 10k per month. I can understand your internal dialogue and that feeling of wanting to beat last month’s income, so I’m not going to ask you to continue sharing the income reports if you feel you need to stop. You’ve already been more than generous and inspirational by sharing what you have shared. However, I do really enjoy reading your income reports and they are a great source of inspiration. They challenge me in a good way. Knowing your story and all it’s taken to get where you are, I’m encouraged that I can do it too. It’s also fun to see you making money and creating the lifestyle you want. I cheer for you every time I read your income reports. Even if you never made more than you’re currently making, I’d still want to read the reports to know that you’re continuing to do well in your pursuits. As for responding to those who inquire about your income, maybe you should simply direct them here to your income reports. That way, if they truly want to see what you make they can take the time to look, and you don’t have to deal with any awkwardness the numbers might create. I’ve been reading your posts since before you quit the 9-5’r. You have been inspiring. Your income is your business. All a family member needs to know is you are doing well. I’d leave it at that. That’s kind of putting you on the spot, in my opinion. My family doesn’t ask, nor I them. BTW, I am still using Republic Wireless that you had recommended maybe 1 1/2 years ago. Doing so has saved me lots!! Thanks!!! Keep up the good work and pat yourself on the back, you exceeded what you had set out to do and are grabbing for the next rung. Nothing wrong with success. Should you feel bad that you are not homeless, no, grateful that you are where you are. Thank you for sharing all this time and motivating others with your success!!! Forward to the $120K!!! Alexa-you’ve worked hard for that money. There should be NO guilt. Maybe you can offer to help your relatives think differently about budgeting/earning more money/ or how to create opportunities for themselves. I wish I could! I think where I come from it’s just really hard to break down that barrier that you’ll ever make more than X amount of money. I think you’ll lose half your readers if you stop posting your income reports….. Lol! We love them:) I first found you back in your early days when you had a guest post on money saving mom. I do have a question. Is most of your freelance income these days from writing or VA work? Have you found one to be more lucrative than the other? Congratulations on having a great month! I’d say it’s mostly from VA work but I can’t really break it down into specifics because it’s combined. For instance, I have two clients and I do both writing and VA work for both of them and then get paid in a lump sum. It all depends on the week. Sometimes there will be a ton of writing and sometimes only a couple of posts. And sorry for being so late responding to comments! I remember reading your blog even before you quit your job! I haven’t been active in the blog world lately, but just caught this post and I am so PROUD of you and so INSPIRED by you! Seriously. Do you know that you’re an inspiration to people? That must feel amazing! I’m hoping to be right there with you some day! Love all these comments. You have earned the money. That is not the issue. Well, not the whole issue. This topic could generate loads of blog post ideas ! I have always known that the biggest employer in my town has some high paying jobs for the top folks with experience. I know many families with a parent that works there ….. I was recently clued in that those ” high paying ” jobs were $400k per year. Uh, huh. $400k. This number is about 20x what I live on. On a really good year, it is only 15X. The best question is : Are their kids spoiled ?. Hmmm. No, not all. It is not the amount of money the parent makes that determines if the child is spoiled. I have chaperoned school field trips where the children are discussing which vacation areas their families second home is … I was recently asked by an 8 yr if would buy him Sushi for lunch… ( $9 a box, he can eat two). Does that make him a brat ? No. He’s just a kid asking for something to eat. Pouting and sitting on the floor in Whole Foods was a bratty moment. ; ) Frankly, There are kids acting spoiled in The Dollar Store too. Yes 🙂 So it’s more about what you do with it/how you act, not what you make! I LOVE your income reports. Please keep them coming! Keep them coming! I’m hoping to start getting into freelancing soon and am learning all that I can. I love seeing your income reports they are inspring!! Keep up the great work. To be honest, I really look forward to your income reports each month, as they really inspire me! Whatever you decide, I’m totally rooting for you to make more money and stay motivated! I have been where you are now and TOTALLY get it! I started doing income reports to show our families progress to selling six figures on Amazon FBA and when we got to where we were making the six figures, but not working many hours it was really hard to keep posting. Another thing we found was that having income reports posted opens you up to all kinds of personal questions, being a pretty quiet person, it is weird for me having people question every aspect of my life! Then, then family/friends things started to get awkward as they were reading the site as well. I, personally, have been very motivated by you income reports. But, ultimatly, the decision on how much to share is yours. Great blog.